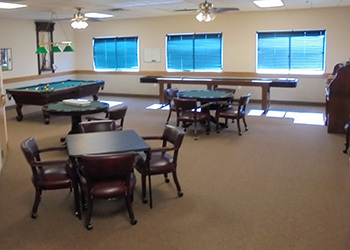 At Sterling Court, we understand that the activities of daily living can often become burdensome. Our professional, friendly staff is here to help each resident attain their highest functional ability in order to help them enjoy the retirement lifestyle they have been looking forward to. At Sterling Court, we also offer physical therapy to our assisted living residents. Our physical therapy team works toward specific goals of achieving the resident’s highest functional level of independence. Physical therapy focuses on identification and rehabilitation of individuals with physical impairment and pain, as well as future injury prevention. Following the evaluation, our experienced physical therapists develop an individualized treatment program. The goal is to achieve safety in a variety of areas.